I love dreadnoughts because of two reasons. Number one the name dreadnought is a little on the extra cool side. Number two, their projection and the fullness of the sound they produce is unparalleled by any other design for guitars. You can argue that every guitar has its merits, of course, but I prefer myself a dreadnought. The Bristol BD-16 Dreadnought is one of the many of affordable instruments you should definitely consider picking. Let’s take a deeper look. The body design, as already mentioned is dreadnought. This means that the guitar is bulky, a little more than most of its cousin designs. Still the guitar remains comfortable to play and hold, though children might need a time to adjust. The topwood is solid spruce, a definitely good tonewood choice for a dreadnought guitar. The back and sides are mahogany, a solid choice, if inferior rosewood. This might have been the intention though since mahogany is much lighter than rosewood, and with a dreadnought body, comfort and lightness is important. The neck is also made of mahogany and is rather slim and incredibly comfortable and easy to play. 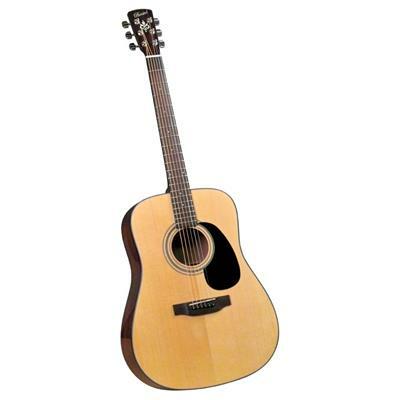 The guitar’s bulk, as a result of smart tonewood choice, does not translate into weight. All of this is of course laminated, meaning the guitar will not be aging, neither will its sound be maturing. The rosewood fretboard is smooth and a pleasure to play. The entirety of the world has gotten very used to the fact that chrome is the material of choice for hardware. This is a good thing, judging how this very guitar is benefitting from with sturdiness and a long lifetime. The ABS nut and saddle of the guitar might present a bit of problem, as plastic tends to not be the most reliable material. Still, easily replaceable and even if you do not replace it, for a beginner it should work fine. The tuners are steady, you might have to retune your guitar every once in awhile. This guitar does not suffer from the same tuning problems many cheap guitars have. The sound on this guitar is something in between a beautiful choir and a lovely birdsong. The dreadnought design adds a great deal of power and depth to the sound, allowing the tones to be well expressed in all registers and strongly projected into the world. The spruce top helps express those higher register tones, while the mahogany back and sides support the lower and mid range. This results in an incredibly well rounded sound. The guarantee is, this guitar will be turning heads once you start playing it. Beginners and even professionals might find that this guitar sounds much better than they expected it to. When I think about how much this guitar is being sold for, I realize that it has no right to be as good as it is. With a solid sound and a very handsome design, I wonder if there are problems I do not yet know about. The only one problem I know of is the plastic nut and saddle of the guitar, but even that is easy to fix. Definitely a worthy entry into the history of guitars. A great fit for beginner and professional alike. Click here to find out more about Bristol BD‌-16 Dreadnaught.